The Joslyns purchased the Sutphen farm in 1893 and began landscaping the five-acre site. Omaha architect John McDonald designed the mansion to resemble a Scottish manor. Named Lynhurst and known locally as "Joslyn Castle," the thirty-four-room house was completed in 1903. It includes an interior conservatory designed by landscape architect Jens Jensen in 1913. The Joslyns made their fortune in the ready-print news business and owned the Western Newspaper Union. They gave generously to many Omaha organizations. 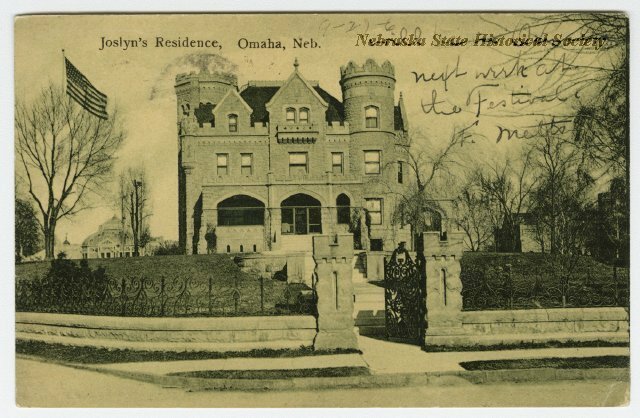 “George and Sarah Joslyn Home,” Explore Nebraska History, accessed April 18, 2019, https://mynehistory.com/items/show/197.